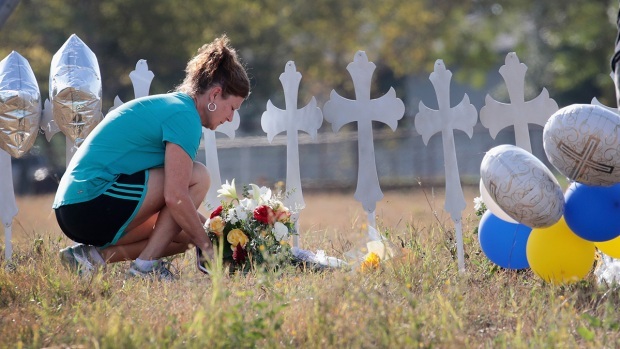 A man opened fire on a church in South Texas on Sunday, killing more than 20 people and wounding others. — Oct. 1, 2017: A gunman identified by authorities as Stephen Paddock opened fire on an outdoor music festival on the Las Vegas Strip from the 32nd floor of a hotel-casino, killing 58 people and wounding more than 500. SWAT teams with explosives then stormed his room and found he had killed himself. — June 12, 2016: Gunman Omar Mateen opened fire at an Orlando, Florida, nightclub, killing 49 people. Mateen was later killed in a shootout with police. — Feb. 20, 2016: Jason Dalton, 45, is accused of randomly shooting and killing six people and severely wounding two others during a series of attacks over several hours in the Kalamazoo, Michigan, area. Authorities say he paused between shootings to make money as an Uber driver. He faces murder and attempted-murder charges. —July 20, 2012: James Holmes, 27, fatally shot 12 people and injured 70 in an Aurora, Colorado, movie theater. He was sentenced to life in prison without parole.